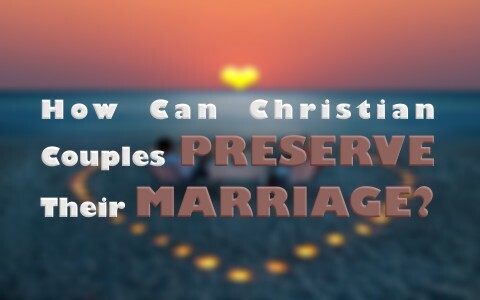 How Can Christian Couples Preserve Their Marriage? With divorces increasing, even among Christian couples, what can a couple do to preserve their marriage? One man who I spoke with told me, “I must admit…I’m not a fan of going out to hear orchestras or watching musicals, and even ballet, but I do know my wife and daughter are, so, that’s where I’m going tonight.” What was even more amazing is, his favorite time was playing a critical game that night on TV, so what he did was to defer in doing what he wanted, and instead, do what his girls wanted to do, and you know what I learned from my Christian co-worker? He put their interests ahead of his own. I think that man’s marriage is on a lot more solid ground than most, many of which are on sinking sand. That’s because he cares enough to think about his wife, her feelings, her desires, and her interests, and that man’s actions match up with Philippians 2:4, where the Apostle Paul wrote, “Let each of you look not only to his own interests, but also to the interests of others.” This man truly desired Christ-likeness, because this man “emptied himself, by taking the form of a servant” (Phil 2:6) to his family. I think he knew that even our Lord and Master “humbled himself by becoming obedient to the point of death, even death on a cross” (Phil 2:8). If someone ever counsels with me about their marriage, and they start to divide up everything as close to 50-50 as possible (which has happened), I can tell that marriage is already in trouble. Sand is really the only place you can draw a line, but for marriage, it’s about give and take. I believe it’s unwise to keep track of what each spouse does like in a checkbook ledger. To my shame, I do not spend enough time just sitting down talking to my wife. I have tried to do better because I know the importance of listening. I remind myself of James 1:19 where he writes, “Know this, my beloved brothers: let every person be quick to hear, slow to speak, slow to anger; for the anger of man does not produce the righteousness of God.” Of course anger does no good in most cases, but the keys to this verse is “be quick to hear,” I am usually quick to speak, but I’ve tried harder in being “slow to speak” and “quick to hear” when my wife is talking. To me, love is more than words or feelings. For example, love let’s others speak first; love allows others to finish their sentence; love does not interrupt others while they’re talking; love is not talking while others are talking in a group (Bible study, etc.). Love admits wrong. What power there is in these 7 little words: “I’m sorry, I love you,” and “Thank you.” I have also learned that it helps to ask diagnostic questions like, “How are you today? How did your day go? Can I do something for you?” instead of dumping on her like, “Wow, it was a bad day today….you won’t believe what happened.” She may have had a worse day then I did, and now, she can’t get a word in edge wise. Other questions might be, “Is everything okay? I’ve got time to talk if you want.” This allows for the doors of communication to stay open. One of the very first businesses I worked for went out of business because of a failure in communications, so how much more important is that in a marriage? What I mean by “have the funeral,” is that we have to bury the past, just like God forgives us, and our sins are permanently removed. God doesn’t keep bringing up our past sins. If you feel like He is, then that’s probably the enemy who wants to remind you of it, but I love Dr. Irwin Lutzer’s response to that: “When the Devil reminds you of your past, remind him of his future” (Rev 20:10). The Apostle Peter specifically tells the Christian husband to “live with your wives in an understanding way, showing honor to the woman as the weaker vessel, since they are heirs with you of the grace of life, so that your prayers may not be hindered” (1st Pet 3:7). In other words, don’t trip over what’s behind them. Put it to rest. If we revive old offenses, then we are going back to open up old wounds and never allowing them to heal. In some of the best marital advice there is (in and out of the Bible), the Apostle Paul writes a command to both the husband and the wife, saying, “let each one of you love his wife as himself, and let the wife see that she respects her husband” (Eph 5:33). Here’s one way to look at it. When a husband is respected, he feels loved; when a wife feels loved, she feels respected. It’s like giving each spouse their deepest need…love and respect. When my wife respects me, I never feel more loved, and I hope, when she feels loved, she never feels more respected. The way God hardwired men is they need their wife to respect them, and the woman needs to feel loved. That meets them both at their deepest, most significant need. I could not write about Christian marriage without mentioning the importance of God. In fact, this is the most essential element in any marriage….the Holy Spirit. We can grieve, quench, and resist the Spirit of God, and that creates a fleshly-tension in the marriage. When one of the spouses is living in the flesh, for example, not loving His wife like Christ loved the church, it makes it harder for her to respect her husband. How much easier it would be for Christian wives to respect their husbands if their husbands loved them like Christ. When a wife feels cherished by her husband, she’s going to have a much easier time respecting him, even if he works on sewer lines or works as a janitor (both of which, I have done!). Solomon’s godly wisdom tells us that “Two are better than one, because they have a good reward for their toil. For if they fall, one will lift up his fellow. But woe to him who is alone when he falls and has not another to lift him up” (Eccl 4:9-10), so in that context, and not necessarily the context of marriage, he adds, “And though a man might prevail against one who is alone, two will withstand him—a threefold cord is not quickly broken” (Eccl 4:12). Of course this could refer to a friendship of another Christian believer, but it could also include a marital relationship, but I believe the way two can be held together, particularly husband and wife, is by that “threefold cord,” and if that third cord is God, then that cord has considerably greater strength than with just the two cords alone. With the little naval experience I have, I have still noticed that most ropes are made of three separate cords (minimum), which are then folded around each other. That now makes one cord as strong as three, so the lesson is, Christian couples must worship together, they must pray together, and they must study the Word together, and that threefold cord can strengthen their marriage like few other things can…even more so if that third cord is God. One elderly couple sat in the airport holding hands. Next to them was a newlywed couple, so the just-married man asked how long they had been married. The husband said, “49 years.” The wife asked, “What’s the secret to your marriage lasting so long?” and the husband sat and thought about it, but his wife spoke immediately. She said, “Learn to forgive.” Her husband laughed, and said, “Yes, that’s it.” Christian couples must learn to forgive one another, put up with one another’s little annoyances, and remember to “be quick to hear, slow to speak, slow to anger,” When God is that third cord, any marriage is not quickly (or easily) broken. Previous post: Why Did God Create Pets?